.... witch used to have tonnes of great Carrey DVD screencaptures of him in all the scenes throght the movie, it included ace vantura, bruce almighty and some others aswell as Batman Forever, it was cool, but for some reason the site dont work anymore and/or it doesnt exist anymore either, and what a shame it was REALLLY WONDERFUL TOO!! !....mybe the person who made the site doesnt like Carrey anymore, ......well she/he could of at least flipping left it for people who do for heck sake, i mean, no offence, i know it was their property and they can do what the hell they want wit it, even destroy it if they must but it was sooo beautiful and i just dont see why he/she went through all the trouble making a cool site then destorying it. ....blurgh.....oh, anyway.... for some reason i'm very much bewellded by Jim as the riddler. 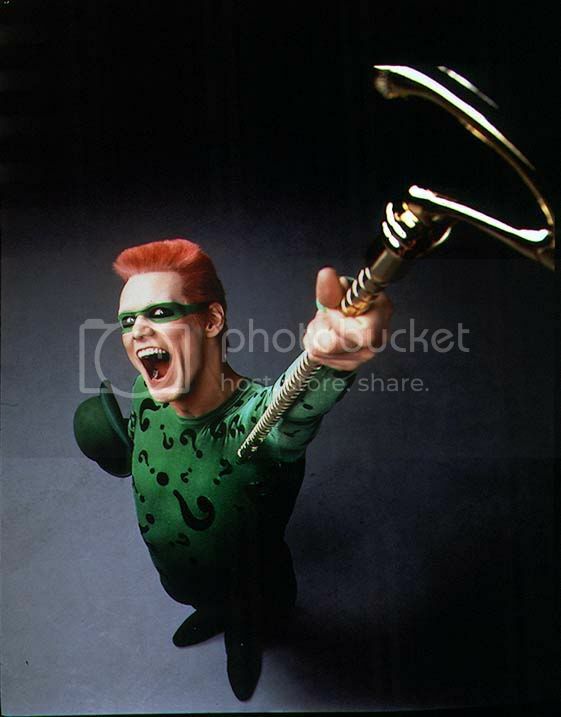 the riddler both scared me to death aswell as secuced my heart for me to like him when i was a child, and now and then i go back to the feelings of the thrills that green freak gave me. lol. so yea, i was wondering if there was anywhere i could get cool DVD screencapture pics of him, i've tried searching on the internet myself but have found nothing. damn. oh well....thanks anyway, bye. I know it was a great site but she had to close it. She had no choice. I miss Bellbee. anyother way i could get The DVD SC of BF? I have never seen a dvd of screen captures for that movies. Is there one? cotton wrote: I have never seen a dvd of screen captures for that movies. Is there one? well, they did untill the lady you call Bellbee closed her carry show.net site. *sigh*......i was so happy back in the day when i found that site.......SO VERY HAPPY!!!!!!!!!! *stops and calms down* heh.....sorry. No, I think she meant was there a DVD out there, which featured all the screen caps. I think it was a misunderstanding of your previous post. There is no such DVD.....and I think if you want a load of screen caps from Batman Forever, the best way to do it is save up and get the DVD! so ya know, i just thought i check before anythign else. Aaaaah yes. I know the one you mean. You're amongst friends here.... ......we understand! I think JCO is full of a huge myriad of Jim Carrey fans and perhaps some do screencaps, but I know that I don't really have any I've done. You were right to ask, and perhaps someone will come along and post and say they have a pile of BF ones. But, to my knowledge, if you want a lot from that film....perhaps you can get them yourself. And then share them with the rest of us of course. Btw, I forgot to say earlier......welcome to JCO. Happy posting. Hmmmm....The Riddler! Gotta love 'im! Niobe wrote: No, I think she meant was there a DVD out there, which featured all the screen caps. I think it was a misunderstanding of your previous post. By the way, cause of this problem with the laptop I couldnt go through to movie to the one you wanted with the grin. They r so gr8.Jim looks so gr8 and handsome as riddler as well as funny and hilarious. What a gr8 collctions.Thanks a lot for sharing them.